They are often encountered mid-morning or late afternoons foraging for tadpoles in shallow water. They also eat frogs, toads, lizards and invertebrates. 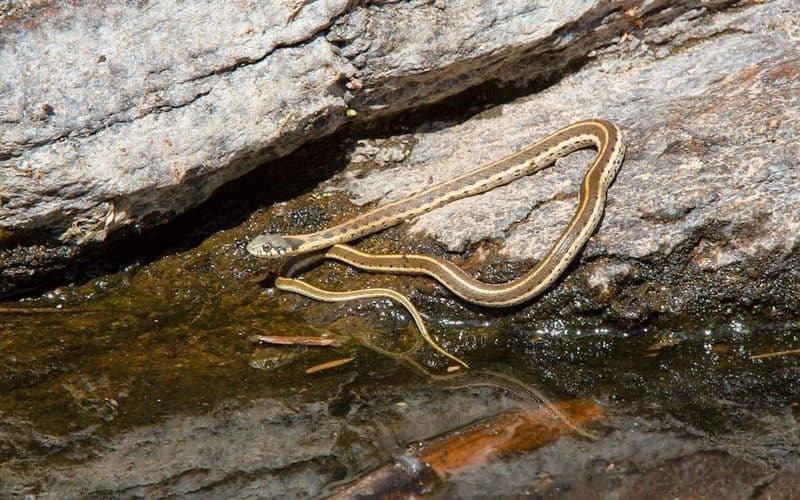 Black-necked garter snakes are a medium sized (up to 42 inches long) slender olive-gray snake with a single bright orange-yellow stripe down the middle of its back and a light stripe on either side. The mid-dorsal stripe is usually orange on the neck shifting to pale yellow on the posterior portion of the body. Two large, jet-black crescent shaped blotches are located on the sides of the neck. The underside is pale gray or cream in color. This snake is found across southeastern and central Arizona. They are highly aquatic and usually found near water in rocky upland canyons and along semi-permanent streams. Here in Sabino canyon they are frequently seen along the creek especially in the riparian area. When the creek flow diminishes they are usually easy to locate near the remaining pools of water where they actively hunt for prey. Although primarily diurnal and crepuscular they are occasionally active on warm nights. They are often encountered mid-morning or late afternoons foraging for tadpoles in shallow water. They also eat frogs, toads, lizards and invertebrates. Garter snakes give birth to live young, up to 25, in July and August. They are usually seen in the canyon between March and November. They hibernate during the cold weather months. They are non-venomous and are harmless to humans. This photograph was taken in March 2011 in Lower Sabino adjacent to the creek near the entrance to the Bluff trail.